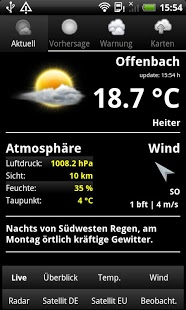 Stay up to date with the current weather conditions in Germany – and in the world via the Weather station widget. 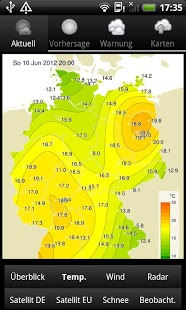 – Maps showing the current temperatures and wind speed. – Four app widgets bring live weather information to your home screen, including weather station widget working world wide! v2.5.2 – Added Miniwidget + improved networking code widgets. v2.2 – Added sunrise and sunset times to Live page + Hi res icons can now also be used in forecast widget + rewrote network code: makes app and widgets faster and more stable. v2.1 – You can now store your preferred German town for the live weather observations, or use the GPS + added extra icons for the Weather Station Widget.